We have really come a long way as a nation. There were 55 million people in Nigeria in 1963, three years after gaining independence from the colonial Masters. In 2015,Nigeria's population rose to 182 million. 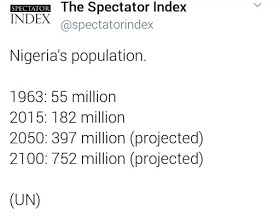 United Nation projects Nigeria's Population to be within 397 million in 2050 and 752 million in 2100. 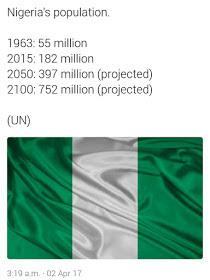 0 Response to "See Nigeria's Population In 1963 And Possible Population Projection By 2050"